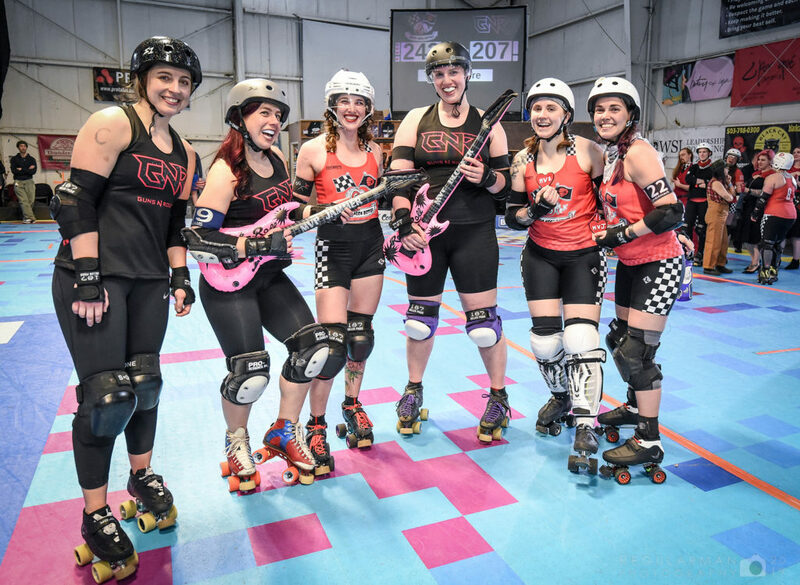 The Break Neck Betties (BNB) took their second win of the season with their 242-207 win over Guns N Rollers (GNR), leaving them the only undefeated home team in a still-young season. While the game was littered with jumbled defenses, there were only three lead changes, two ties, and GNR found itself in the lead for just two jams. In this rematch of the 2018 home team championship game, GNR fought hard, holding the Betties’ jammers to under 5 points in a 70 percent of the jams. Unfortunately for GNR, when the Betties’ scored, they had high-scoring jams. The Betties’ jammers Ovarian Barbarian (O.B.) and Beyond Thunderdame (Dame) combined for 155 points; GNR’s jammer Eve Anne Hellical—last season’s leading point scorer—put up a game-high 99 points in her 13 appearances as jammer. The Betties established their offensive strength during the first 5 jams, but jammer penalties prevented them from building a lead larger than 4 points during this run. GNR came back to close the gap in the next five jams and took the lead for the first time in Jam 10 with a score of 58-55. The two teams traded lead in each of the next two jams, ultimately leading up to the second, and final tie of the game at 73-73 after Jam 16. Then, O.B. broke out for a 24-0 jam that was enabled by powerful offensive blocking from Ripley as a penalty sidelined GNR jammer Shananigunz. GNR clawed its way back and was down by just 7 points going into the last jam of the half. O.B. then skated for a 16-0 jam that gave the Betties a 136-113 lead at the break. Eve Anne Hellical was a bright spot for GNR in the first half as she led all jammers with 60 points, which included a 27-point jam, keeping GNR in the game. The Betties found their rhythm in the second half and never let GNR get within 19 points of their lead. There were three jams in the second half that really propelled the Betties into a commanding lead: Jam 10 saw Dame put up 19 points as teammate Tenacity scored a big forced cut on GNR’s jammer Liv Bators; Jam 13 saw Dame put up a 12-2 jam—again on a power jam; and Jam 17 is where I.V. Cardiattack pulled off a 16-4 run this time with help from Ripley, who had a big knockout on GNR’s jammer Zip. At this point the Betties were ahead by 71 points (214-143), their biggest lead of the game.  Despite this deficit, GNR’s players showed just how tenacious they were: GNR denied the Betties lead jammer in seven of the last eight jams of the bout. 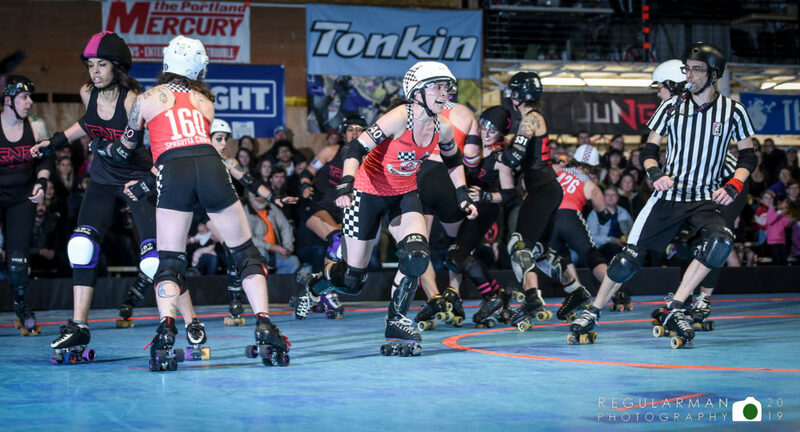 When time ran out, though, GNR’s grit wasn’t enough: the Betties skated off the track with a 242-207 win. The Heartless Heathers (HH)’s defense proved to be key in their 132-113 win over the High Rollers (HR). While all of the Heathers’ jammers made significant contributions to the win—each scored at least 24 points—it was Wheels of Justice veterans Tarantula and Nacho Lucky Day and the strong HH’s blockers that prevented the HR’s jammer corps from having big scoring runs. Polly Wanna Crack’er, who had a breakout performance in the HR’s season opener, for example, was denied a single point in over half of the jams she skated (7 of 13); despite this bleak statistic, though, Polly still managed to be the HR’s top scorer with 46 total points. High Roller jammer Lurz Lemon contends with a Heartless Heathers’ tripod comprised of Tarantula, Nacho Lucky Day, and Stan the Woman. Photography Credit: Regularman Photography. The first half of the game was tight: a majority of the jams had only one scoring pass and the two teams exchanged lead five times. Despite this tough defensive play, the Heathers were able to build a 26-point lead over the first 10 jams. During the next two jams, however, HR’s Polly Wanna Crack’er took advantage of a power jam to score 16 points and then Lurz Lemon followed that run up with another eight points, which gave the High Rollers the lead. The first half also saw frequent use of fast-moving packs as both teams tried to limit opportunities for opposing jammers to score many points: with this tactic, the lead jammer only has time to earn a few points from the back of the pack before having to call off the jam in a bid to deny the other team’s jammer points. In the last 4 jams of the half the Heathers went on a 15-3 scoring run while giving them a lead 66-57. The second half started with more of the same strong defensive play, led by the HH’s MVP blocker, Nacho Lucky Day. 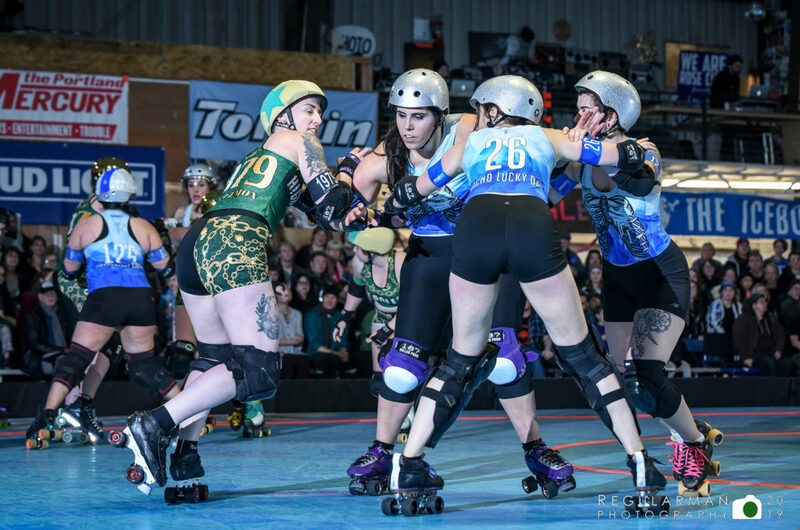 In many of the second half’s jams, it took upwards of a minute before a jammer from either team could break free of the pack. The High Rollers quickly got back into the game with 11 points by Lurz Lemon in her first two jams of the half, tying the game up at 78-78 in Jam 6. After that, though, it was all Heartless Heathers: they got lead in 9 of the next 10 jams and outscored the High Rollers 46-8. During that run, the HH’s MVP Jammer Mia Palau scored 14 points, which was the highest scoring jam to that point. Ultimately Mia scored 23 points in the second half. Polly Wanna Crack’er rallied HR with a 15-points in Jam 19, surpassing Mia’s earlier high-point jam. Despite the big jam, a comeback bid by HR was not to be: the Heathers took the win with a final score of 132-113. Bummed that you missed out on the action? Check out our schedule and grab your tickets to an upcoming game HERE.